In my family, ABC Chicken Soup is as home cooked and comforting as it gets. I grew up drinking this soup and continue to enjoy it to this day. In fact, it is my sons’ favorite soup. Whenever the weather turns cold (like now), they will request for me to cook this soup and I am happy to oblige. 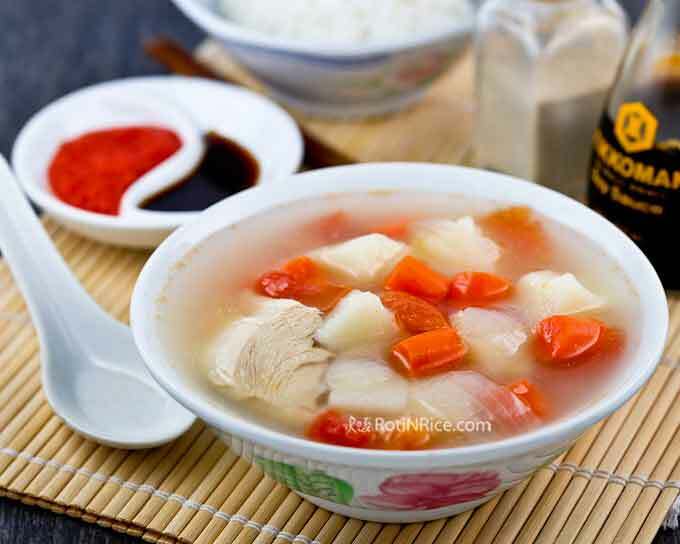 This is one soup that I can easily get the ingredients here – chicken, onion, carrots, potatoes, and tomatoes. 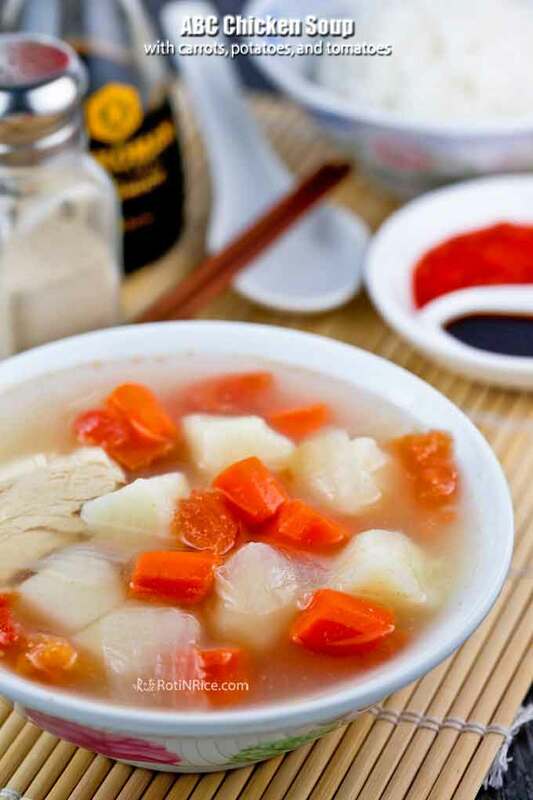 I think most people understand this soup because of the ubiquitous ingredients called for and I am not surprised if other cultures have a similar soup. In some families, slices of corn cut cross-wise are added to the mix but not in mine. We like it just the way it is shown here. 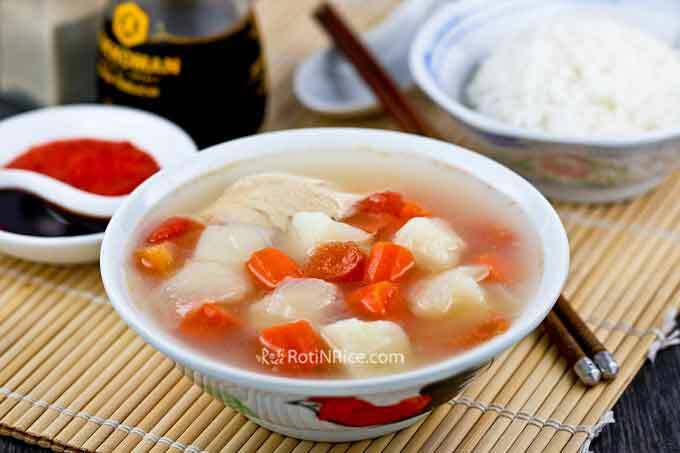 Occasionally though, pork is used instead of chicken but I prefer to use chicken for this soup. Bring water in a large pot to a boil. Add chicken breast, onion, and peppercorns to the pot. When water comes back up to a boil, reduce heat to low. Simmer for about 30 minutes. Skim off any fat appearing on the surface. Add carrots and potatoes. Continue to simmer for another 50 minutes. Finally, add tomatoes and salt. Simmer for another 10 minutes. Turn off stove. 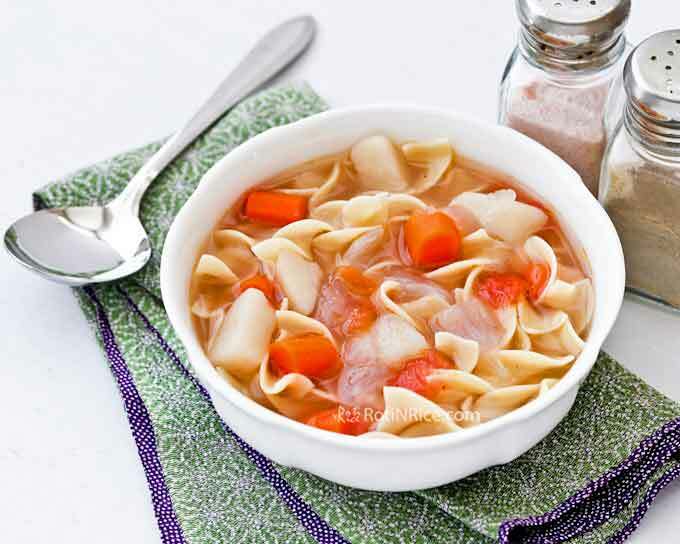 This comforting soup can be just as delicious served with broad curly noodles. Simply cook the noodles as per the packaging instructions and place them in a bowl. Then pour some soup over it and voila! You get ABC Chicken Noodle Soup. 🙂 Do give it a try.